Deirdre Large decided that this year was finally the year to take the plunge. 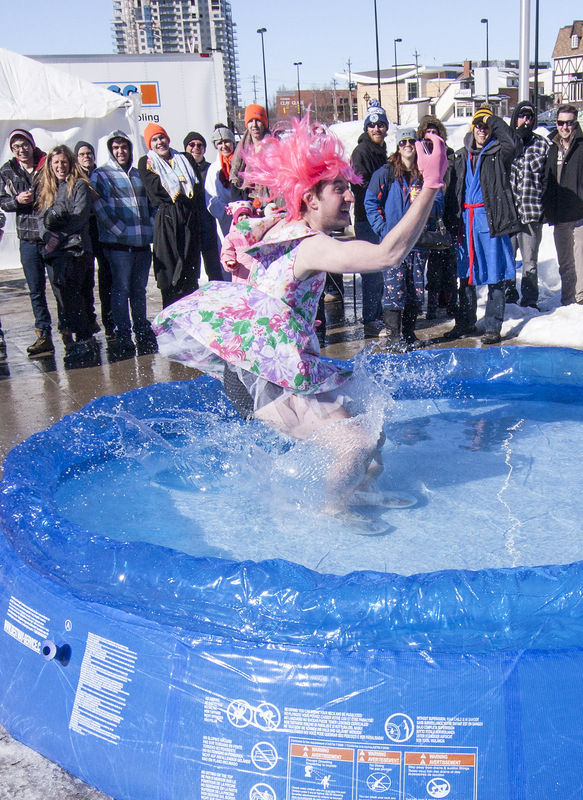 After watching the past two K-W Polar Plunges, she realized that it was the right moment for her to make the leap into ice-cold water for KidsAbility. Her son, Brayden, has been going to KidsAbility since he was 18-months-old, and she wanted to give back. “It was cold, my feet are frozen, but it was worth it,” she laughed. Plunge. And as result of their plunge, approximately $7,092 was raised in support of KidsAbility, a local organization that assists children with cognitive and physical disabilities. 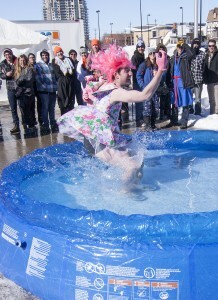 Participants took turns plunging into the pool set up in Waterloo Public Square, some of whom sported costumes. First aid as well as a heating tent were nearby to assist any participants in case of a situation, but the event remained safe. While it was extremely cold, the situation was a bit better than what it could’ve been. The event was originally scheduled for Jan. 25, but with the extremely cold temperatures that most of southern Ontario was experiencing at the time, the organizers decided to move the event a month later to Feb. 22. In its first year in 2012, the event raised $1,500. The following year it raised $7,500, which is a bit more than this year, but organizers relate the slight dip in donations to the date change. “It went really well. We raised a lot of money, which is fantastic [from a] really supportive community,” explained Greg Lehman, the head organizer of the event for the past three years, following his plunge. Jennifer Ball, another participant from Waterloo, decided to jump in support of her best friend’s son who was recently diagnosed with autism. Her team raised around $250. “I think this is great, it’s definitely a great organization and the type of services that they provide for kids is just amazing,” said Ball just before her plunge. But a lot of the participants didn’t have a direct connection to KidsAbility — they just really wanted to help out a local organization. Polar plunges happen in many cities around Ontario, all of which raise money for local foundations. “I love it because I know that most of these people don’t have a direct connection to Kids Ability, but the fact that they come and raise money and do this crazy stunt, means a lot to us,” continued Large. All the donations go straight to KidsAbility’s “undesignated fund,” said Teressa van Vliet, communications coordinator at the foundation. When KidsAbility needs some money for a particular situation, they take it from this fund. “It’s not too pre-determined because we’re not sure about where the greatest need is going to be,” van Vliet said, noting that it could go to therapy and other services, for example. Since the K-W Polar Plunge is a third-party event, KidsAbility has no control on whether or not the event will return for another year. However, they remain optimistic that it will. Lehman said he’d like to continue organizing the event. “Every year, when I jump out of the water, I’m like ‘this is the last year for it,’ but I think I’ll do it again next year,” he said.